The newly renovated Holiday Inn of Hopkinsville is located approximately two miles from Memorial Field Airport and 72 miles from Nashville International Airport. Our amenities include a 24-hour front desk, on-site restaurant and lounge, indoor pool, whirlpool, sauna, on-site fitness center, complimentary newspaper and parking, business center with fax/photocopying services, meeting/banquet facilities, guest laundry and dry cleaning/laundry pickup. We offer extensive banquet and meeting facilities which can accommodate groups of 5 to 300 people. 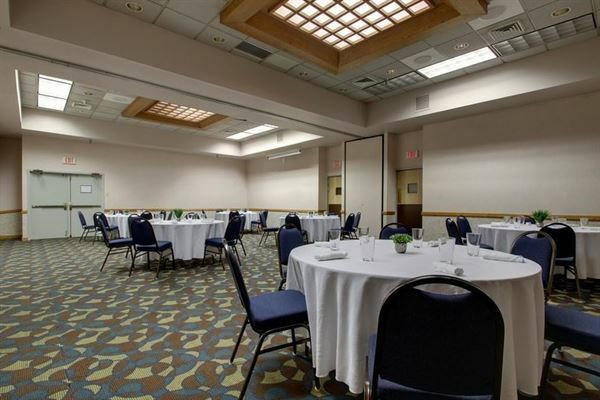 The conference center offers full service meals and breaks and can also accommodate most AV needs your event may require, at an additional charge.